Opponents of teacher pensions can’t seem to help recycling the deeply flawed argument that because of high attrition rates among new teachers, the teaching profession would be better off with 401(k)s or similar account-based plans, instead of defined benefit (DB) pensions that guarantee lifetime retirement income based on salary and years of service. The latest such attack on teacher pensions is a study by the Thomas B. Fordham Institute at the University of Arkansas, (No) Money in the Bank: Which Retirement Systems Penalize New Teachers?, which contends that in the vast majority of public school districts, new teachers would better off with a 401(k). It joins a chorus of reports by the Urban Institute, TeacherPensions.org, and the University of Arkansas contending that 401(k)s will give “most teachers” greater retirement security. However, the truth is that when you examine the public education teaching workforce, a large majority of teachers are much better off with the pensions they have. Conversely, switching to a 401(k) system would slightly improve the retirement incomes of those who leave the teaching profession early, but significantly diminish the retirement incomes of teachers who occupy the vast majority of public school classrooms. This is the definition of throwing the baby out with the bathwater. Part One: Look at the Whole Workforce, Not Just New Entrants. Studies critical of teacher pensions deliberately ignore the teaching workforce and focus exclusively on new entrants in order to propagate the misleading message that “most teachers” won’t collect a decent pension. Part Two: A Bird in the Hand is Worth Two in the Bush. In comparing benefits across plan types, these studies typically neglect the value of guaranteed lifetime pension income relative to lump sums and individualized investment risk in 401(k)s.
Studies opposed to teacher pensions ignore most of the teaching workforce–i.e., teachers currently serving in the profession, most of whom are destined for long careers in the field and benefit from a traditional pension. It’s true that a high percentage of teachers entering the profession will drop out early, particularly in the first few years. Citing data from the National Center for Education Statistics, the Fordham Institute report says, “Nationally, 17 percent of all teachers who started in 2007–08 were no longer in the classroom in 2011, and about 72 percent will leave before twenty years of service.” But this doesn’t actually tell you anything about the composition of the teaching workforce–i.e., the educators who work in public schools today. Most classrooms will see the same teacher return year after year, and often, decade after decade. Even when teachers switch schools, in most cases they get to keep and continue to accrue their pension benefits under the same retirement system. Consequently, most teachers working in public schools today would lose income in a 401(k) compared to a pension. It’s an easy mistake for a lay person to interpret statistics on entering teachers as representative of the teaching workforce. But it’s disingenuous for studies to imply on the basis of new teacher attrition, as the Fordham Institute report does, that “the traditional retirement systems currently in place for most public school teachers favor only a small number of them and penalize many others” (p. 17). The data speaks for itself. Last year, the UC Berkeley Center for Labor Research and Education released a retirement benefit comparison study for the California teaching workforce, Are Teachers Better Off with a Pension or a 401(k)? 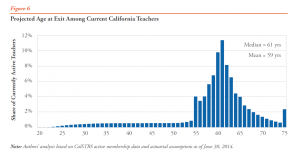 We included in our analysis all teachers currently serving in California schools, from new hires fresh out of school to veterans on the cusp of retirement after 30 or more years. 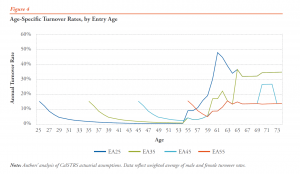 We projected teachers’ career trajectories by applying detailed turnover rates by gender, age, and years of service drawn from the latest actuarial experience study (i.e., real world data on teacher separations and retirements in the state). The typical classroom teacher today in California is 44 years old, and has already taught at least 11 years in the state. 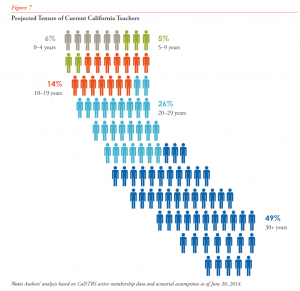 Three out of four teachers (75%) serving in California classrooms will work at least 20 years in public education in the state. Half (49%) will serve at least 30 years. What about all those teachers leaving the profession? It’s true, a lot of new teachers leave—but it turns out these teachers are concentrated in a small share of teaching positions, and overall teaching workforce turnover within California is extraordinarily low. 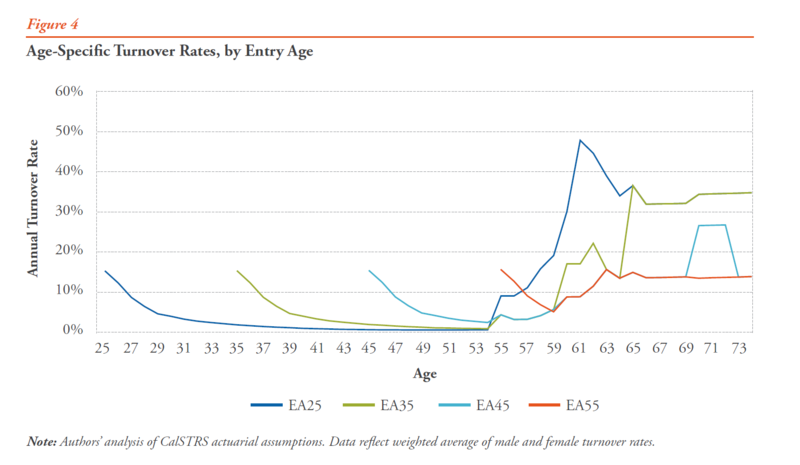 Within a few years after hire, attrition drops sharply and stays low until teachers become eligible for retirement at 55 (See Figure 4, right.). 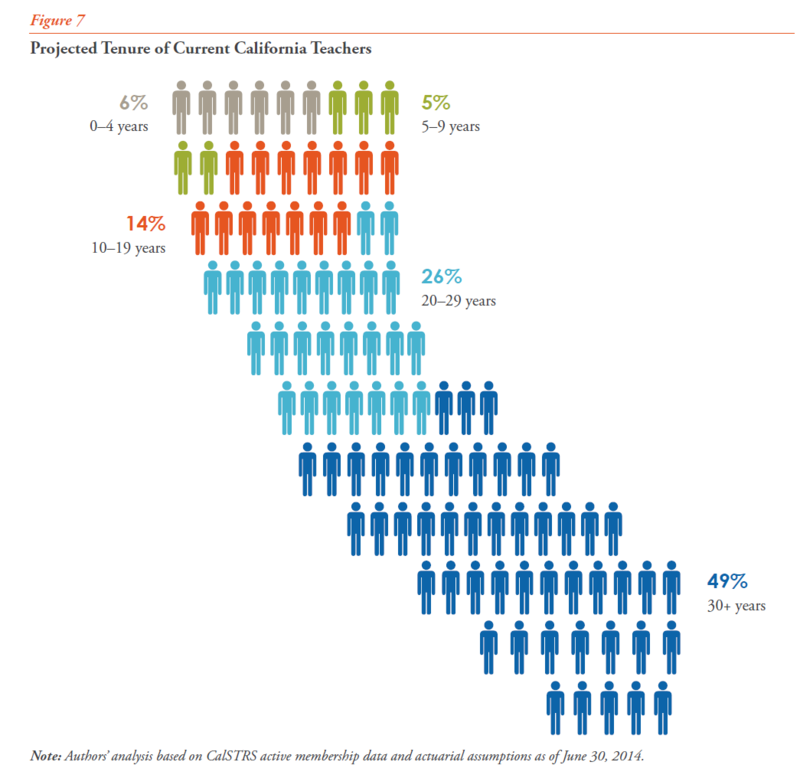 While teachers do switch schools, total annual turnover within the California State Teachers’ Retirement System (CalSTRS) is only 6%, including both separations and retirement. In contrast, annual turnover in private sector employment is about 40%. Based on this profile, our study compared how California teachers fare under CalSTRS pension, compared to an idealized 401(k) with predictable investment returns and no individual investor mistakes. Of course, such a 401(k) does not exist in the real world. Even so, we found that 6 out of 7 California teachers (86%) are better off under the CalSTRS DB pension, and would lose significant retirement income under a perfectly invested 401(k). (See Figure 8 below; click to enlarge.) Most teachers would see a 20-40% reduction in retirement income under an idealized 401(k). Note: Our study was funded by CalSTRS. It’s worth mentioning that CalSTRS and the study authors responded to two separate requests from anti-pension researchers for the underlying data last year, but thus far have not heard any challenges to our key findings regarding the career profiles of active teachers. Those findings can easily be replicated if anyone bothers to do the math, but it doesn’t serve anti-pension advocates to do so. 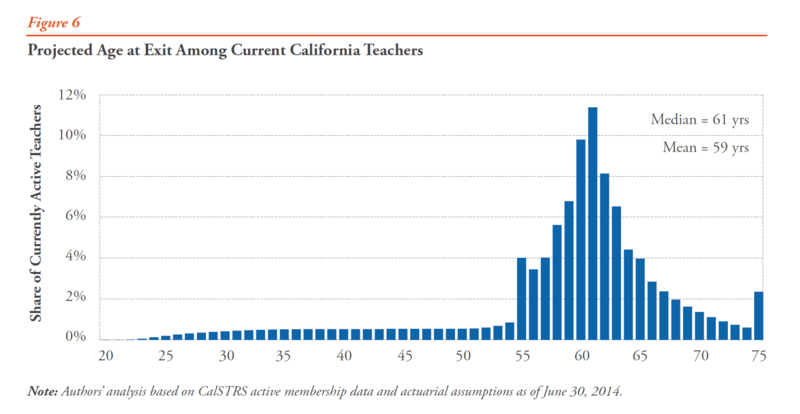 …6 out of 7 California teachers (86%) are better off under the CalSTRS DB pension, and would lose significant retirement income under a perfectly invested 401(k). To be sure, California has a statewide retirement system that covers a large teaching labor market. But it’s also the case that almost every state has a statewide pension system for its teachers, and the vast majority of teachers are covered by a statewide pension that provides significant portability. In Colorado, an independent study of teacher pensions commissioned by the state legislature showed that for most career scenarios, teachers’ existing pension benefits under the Colorado Public Employee Retirement Association (PERA) provides greater retirement income than 401(k) and other account-based systems. This is exactly how teacher pensions are designed to work: support career longevity in a profession that is self-identified as a vocation. To the extent that there are concerns about teachers who enter young and leave mid-career, they can be addressed by modest changes to pension formulas. But there is no compelling equity case for replacing pensions with 401(k)s and hurting the retirement security of the vast majority of classroom teachers. ACA Repeal Would Mean Higher Unemployment in D.C.